This is one of the most spectacular runs in southern California. 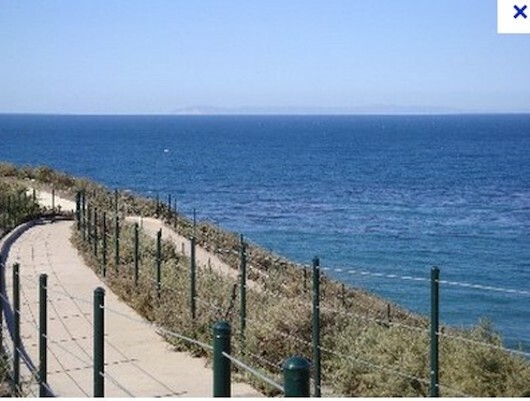 There is a series of headlands and cliffs overlooking Dana Point and Strands Beach, with great views. One can put together a really terrific run here, incorporating a series of parks, trails, and paths along the harbor and marina. We’ve put together a comprehensive 6.3 mile route in this area, but there are options to make it shorter, or add on with some other terrific running spots in the area (see below). A good spot to start is Strands Vista Park, where there is parking. The first 1 mile is a loop around the park and the beachside Strands Revetment Trail. You’ll then climb 200 feet up the trail to Dana Strand Rd., and do a loop around the trails of the Dana Point Headlands. Great views! Get onto Scenic Dr. briefly, and run on the trails of Harbor Point Park, making your way down to Dana Cove. Enjoy a loop of up to 3 miles around the marina and east/west Basin, the boats of the Yacht Club, Ocean Institute, Pilgrim Tall Ship. Our route returns via Scenic Dr., Cove Rd., and Dana Point Hilltop Park. North of Strands Beach. A series of paths and trails around the tony Ritz Carlton Hotel. Along Salt Creek Beach, Sea Terrace Community Park, Monarch Beach Golf Links/Resort and a path through the park, with great view. 4+ miles possible here. South of Strands Beach. Just below the Laguna Cliffs Marriott Resort, there are lovely trails through Lantern Bay Park, along Doheny State Beach, and a trail alongside the Coast Highway.